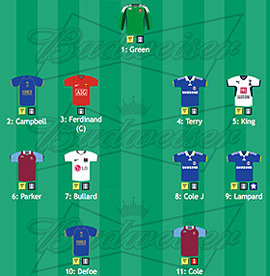 The travails of our fantasy football team of capital-born players. Read previous entries here. With Matthew Kelly nowhere in sight, Arsenal yesterday put on such a convincing performance as a championship-contending side that it was tempting to think Stars In Their Eyes was being re-commissioned. The Gunners' bi-polar personality guarantees that you can never tell which team will turn up. The one that limped to defeats against Hull, Stoke, Middlesbrough? Or the one that tonked Fenerbahce and beat both Manchester United and Chelsea, the latter only their second home defeat in some four years. That both defeats occurred under his watch augurs ill for Luis Felipe Scolari, who responded by railing against the first goal – he had a point, as Robin van Persie was a good yard or two offside when he coasted the ball into the roof of the net.Yet his ire glosses over the grander problem that this was a game in which Chelsea's dominance wasn't enough to secure the points. While they are in second place, it's difficult to imagine the club stomaching any further defeats at home. With Manchester United yet to visit, Scolari will have trouble sleeping the week leading up to that particular fixture. With Londonist United boasting a trio of Blues players, it wasn't the most progressive of weeks of sides. Indeed, John Terry was lucky to escape a red card when he sharked in aggressively during the second half on an Arsenal full back with his studs, and hackles, raised menacingly. Thankfully, Rio Ferdinand's position at the heart of United's 1-0 win against rivals minted Mancunian rivals City meant a decent few points, while Jermaine Defoe did nothing to harm his chances of a transfer-window reunion with his former boss at West Ham and Portsmouth, Harry Redknapp, whose Spurs side's defeat at home to Everton left them balanced above the drop zone on goal difference alone. In this year's oddly distended league table, even Fulham in 10th position, who earned themselves a creditable draw at Aston Villa on Saturday, are only a bad weekend away from the trapdoor. Happily, our compadres at West Ham have just (quite literally minutes ago) completed a useful draw away to Anfield. That long-standing record of conceding in every single sodding Premier League game has been firmly put to bed, and Robert Green, a decent stopper waylaid by some often pitiful defending just yards in front of him, should feel vindicated. Are you watching Fabio?